Can't go wrong with this item. Takes only moments to install and provides a sufficient seal. I have been looking for this type of weather-stripping to use on my patio door. I needed a product that did not require tools, as it is very hard for me to get down on my knees. This product works perfectly so far. This seems to be working pretty good. quality is better than the other strip I had on my kitchen door, just wished you had it in black. Seal it out for good!!! I use this product around the doors to keep the cold out. It really does the job. Excellent product and a great deal ! very handy for that apartment door leading to the cold hall. I need more...they worked out so good. Have had to use several rolls over 20 years in 3 apts and have never seen any other products that could come close to the performance level of these. I strongly recommend this product if you want to stop air intrusion around doors and with your imagination other possibilities. Moving into new (for me) Condo. Front door leading to hallway had a 2" gap at bottom, no big deal, just somewhat annoying. Let light through and some odors from other'ss cooking. Hoping this helps to eliminate the light. Not sure at this point it will prevent cooking odors. We'll see. 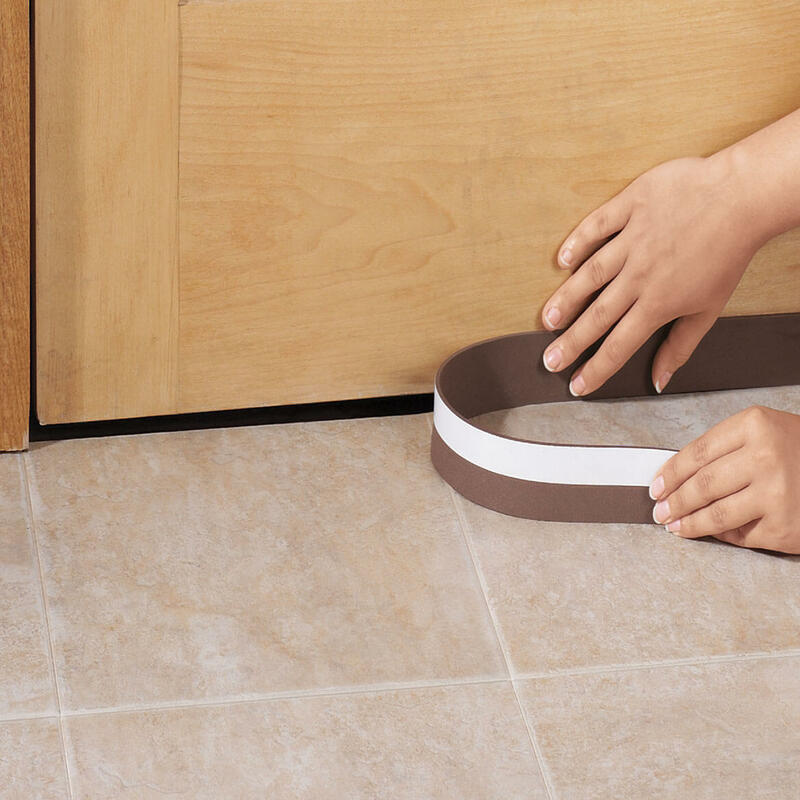 This product is really good at keeping out drafts from under doors! My husband was happy with this product application. Too soon to tell how well it will work but my husband was impressed with the application and how well it was "sealing" the areas he applied it to. It's great for arthritic's who have trouble stooping. It's a timesaver and all I have to do now is shut the door! Easy to apply the longer it seals the tighter it holes on. I need more will order this is a good item does as it says. Easy to apply. Used the weatherstripping on the basement door. easy to put on, looks great & it works! Very easy to install door sweep, Keeps he cold air out. The next best thing to the invention of peanut butter. Terrific product. use on inside bedroom doors also to prevent cooking orders from going on clothes and furniture. A great invention. Have not seen in stores around here just the metal strips. Purchased 5 more after initial purchase of 3 liked them so much! I ordered the first two and after shopping for more locally, which this type of stripping didn't exist, I ordered four more, it takes two to do the long side of a door. The brown color blends great with wood and the adhesive is really good. I would recommend this. these are great for keeping out cold or hot air. Works perfectly to keep out drafts! Didn't have any trouble uncurling to stick on. Has been on my front door for a over a month and adhesion and foam have both held up perfectly. Looks pretty good once installed too! I happy I found them in your catalog. This Bottom Door Weatherstripping is a favorite of mine. The draft the bring cold air into my home is slowed down because I use these. I replace them every 2 years & they work. Not only for the cold weather! I purchased this product for the first time a few years ago to help keep dust out of my NYC apartment. You can tell it does the job when the seal has to be removed for painting and a dark line of debri is very visible. I bought one to see how it works. Loved it bought 3 more. Stays in place. I bought this product to keep rain and air from entering the bottom of my back door. I recommend this product. My doors are uneven and this keeps the old out. My bedroom door opens to the living room and I am using this product to block out the light from the living room and it works great. I put them on the storm doors. to keep out the wind. Our front door has wide gap up the side. Tried several products, applied this and it works great! I have tried many different tems to sop draft at both my front and back doors but this has worked the best. Thanks! I have ordered this product twice and am still using the first one I purchased. I use it around my entire front door to keep air and small knats out of my house winter and summer. It really works great. Will continue to use this product until I move. This is the second time I bought this product. Great product for keeping bottom of doors sealed from wind, cold, and loss of heat or air. It was what I needed ! Perfect- Many Thanks ! I am back to buy more. I pulled mine off because the building got repainted. I am buying new to replace the old stuff. This works great along the small crack along the hinges in the front door and it is so easy to put up. I have the lowest heat bills in the complex. Our doors go to the outside. It doesn't interfere with the closing of the door. Inexpensive way to solve a problem. Works great keeping an outside door tight from wind and dust. I Have an old house so lot of leaks. I put these at the bottom of the doors and that stopped a lot of air coming thru they are great. Keeps the winter wind out. This product is easy to install and seems to do the job. We were a little hesitant at first but it seems to be doing the job. it was easy to install and it helped keep air in and heat out I cant wait till winter and see how it works then.It was affordable too ! I bought two of these for my sister for her house. Just wanted to try it to keep the light from shining under my bedroom door. To help winterize my home. I have tried other things that make opening closing the door. Help control two drafty doors. I really like this product the white is perfect for the white doors that I need this for. It blends in perfectly. I am out of this item. Wanted to see if it will keep the cold air out. Needed for my door. Easy To Install and very durable, I have the white door strip. The adhesive on the back is self stick and stays put..Keeps the cold air out in the winter months. Excellent price. These are going to take the air draft less. needed it for my other house. It is for a friend to keep out air and anything else from the basement. This works well on our double French glass doors in dinning area, so buying more for doors in living room. Keeps cold air and tiny bugs out! Have a door in my utility room that has a gap at the bottom and hope this will help keep out the cold air this winter. Bought this last fall for my double doors in dinning area. Works great for keeping draft out. Still in place after 10 months. Buying more for all other doors on ground floor. merchandise and great sale prices. Love the deals with free shipping. Cold air coming in front door. To keep drafts to a minimum. This is for use in the way it is supposed to be. Great way to keep drafts out in cold, windy weather. Save money on your energy bill. Can this be used on the inside of a door that is frequently opened on CARPET. ? It is our main door from the apartment and will be opened often..
BEST ANSWER: Excellent product -- easily applied. You control the height of the stripping but it does work on carpet. Really cuts down on the drafts. I had it before and had to replace it after three years of hard service (front door to house). Recommend it to anyone. I have mine on both my front and back doors they have been on there for over a year now so I would say yes.however I don't have any rugging there so that part of the question I couldn't answer but I will say the tape is pretty strong. why are your reviews and questions so old?? Like from 2013, none from 2019 or even 2018????? Same thing for most of the items I look at. I would buy it again as it eliminated some of the draft at the bottom of the door. Thank you but that still doesn't answer my question,,,, why are all the reviews years old?? Can this be used on the bottom of a shower door? BEST ANSWER: I doubt it would stick in a wet environment. Worked excellently on bottom of a door. Very sticky. its very flimsy, with the tape and all I can't see it lasting too long. Can I use with a vinyl door? BEST ANSWER: Yes, as long as the door does not have any kind of slippery coating to it. 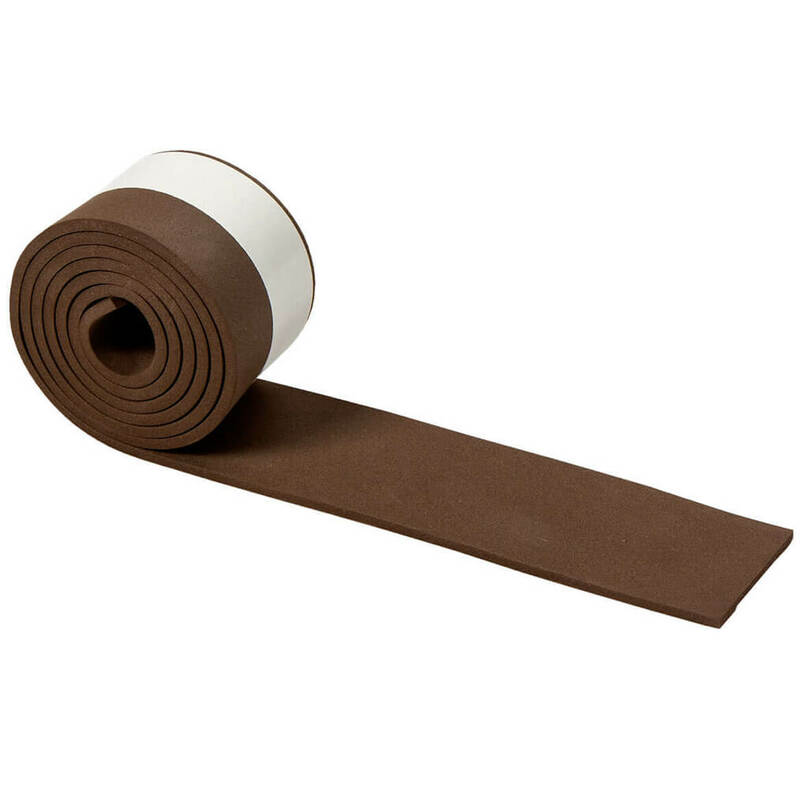 The weathersripping use a sticky adhesive-type tape on the back of the strip to attach to the door. Will the Adhesive Adhere to a metal apt front inside door ? BEST ANSWER: Thank you for your question. The adhesive can work with wood or aluminum doors only. We hope this information will be of help to you. Can this product be used at sides and top of doors as well? BEST ANSWER: Yes, I have used it on the top.